Students will investigate natural landforms - hills and valleys, gullies or bays, undertake map work, and examine the geological and human history of the area before heading into the bush to examine the natural environment. A comparison will be undertaken of two different landscapes situated on different parts of the landform they are studying, to examine the affect of abiotic factors such as soil moisture (measured using a soil moisture meter) and soil depth (measured using a soil depth spike) on the height of trees (measured using a laser rangefinder). The impact of human activities on the area will be examined and discussed. A creek water animal catch will be undertaken to determine the health of the creek by using the animals as indicator species. The interaction of the landscape with fire will be examined, with an in depth discussion of fire management and how its use has changed from Indigenous land management to current land management. 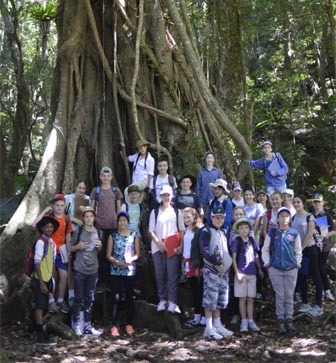 Students will investigate the Mt Keira Escarpment and examine the geological and human history of the area from a lookout, before heading into the bush to examine the natural environment. Students will measure physical characteristics such as foliage cover (using a coverscope), tree height (using a laser rangefinder) and soil moisture (using a soil moisture meter) in two landscapes - open forest (at the top of the escarpment) and rainforest (at the bottom of the escarpment). Students will observe evidence of mass movements - landslides, landslips and rockfalls, as an example of a local geomorphic hazard, and will use hand lenses to observe the geology of rockfalls up close. Students will investigate coastal landforms, and examine the geological and human history of the area. At the base of Long Reef headland, students will look for fossil evidence to build a story about the ancient river delta responsible for the geology of Long Reef. Students will examine the geographical processes involved in creating and shaping the landscape by using anemometers to measure wind speed, and observing wave action from the top of the headland. After an examination of human impact on coastal erosion, all students will walk to Collaroy where they will examine coastal management using their surroundings as well as archival photos which demonstrate examples of coastal erosion due to storm damage.